French Guiana is a department of France in South America, bordered by Suriname to the west and Brazil to the south and East. French is the official language, but a widespread Guiana Creole is spoken. 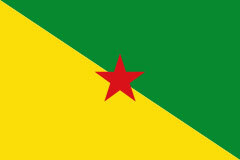 Guiana is 84.6% Christian, of which 80% are Roman Catholic , 3.9% are Protestant. 3.6% practice Chinese folk religion. 3.5% are practicing Spiritist. 3% are non-religious/atheist. 1.9% hold traditional beliefs. Hindus comprise 1.6% of the population. 0.9% are muslims. 0.9% are other beliefs(2000).